Easily charge for extra services such as gift wrap, express delivery and others in Magento. 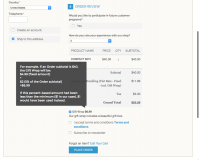 Add a checkbox to allow customers to opt in for an extra service. Extra Fee extension for Magento enables you to set up an optional service, such as gift wrap, rush order, or anything else relevant to your business, and charge extra for it – either a fixed amount or a percentage. Your customers will be able to choose the option during checkout. Why Use Extra Fee Module? Easily charge extra for gift wrap in Magento. Easily charge extra for express delivery. Easily charge a fee for any extra service you provide. Quality products are no longer enough to stand out among competitors. Customers demand a personalized approach and extra services, so using the extension you can ensure they get what they want. Such things as gift wrapping or express delivery can become a silver bullet in winning customers’ attention. Looking for an additional service to go with their purchase, customers will be ready to pay for it if it matches their expectations. Not only the extension allows to add those services to your store, but also to set up special prices for each extra option. This increases the average value of orders on your website, contributing to a higher revenue. With a wide range of extra order fulfillment capabilities at your store, you ensure a better customer service to your visitors. As a result, you meet and even exceed their requirements and expectations, which ultimately increases their satisfaction and loyalty, turning them into true brand advocates rather than one-time buyers. .
Set up an extra fee such as gift wrap, express delivery in Magento. Use a price percentage or a fixed fee. Add a respective extra fee checkbox to checkout. Specify a custom name and description for your extra service. Works perfectly with Magento’s default one-page and multishipping checkout modes. Supports English, German, French, Spanish, Dutch and Italian languages. The extension's functionality code is 100% Open Source. Compatible with AII-In-One Checkout Magento extension by Aitoc and its components. 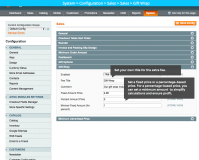 Magento Cross Sell / Upsell extension - Take advantage of upselling and cross-selling at your store. Showcase similar and alternative products as well as best sellers as visitors browse your product pages to increase the chances of a purchase. Magento Personal Promotions module - Target your customers with personalized offers and deals. Segment your buyers and subscribers into separate groups and configure specific discount rules for each of them. Wedding Gift Registry extension for Magento - Allow customers to create wish-lists for any occasion, set priorities for items in the list and share them with friends. Buyers can protect registries with a password and track the purchases made. See all Marketing and Promotion extensions for Magento. * Fixed the issue with incorrect work of extension when 'Checkout with Multiple Adresses' is used. * Fixed the issue with the non-default currencies. * Compatibility fix with PayPal payment gateway when changing shipping method on order review page. This extension installs cleanly and presents itself with just the right features. I like an extension that solves a simple problem and from a vendor that produces solid code. Provide a custom-tailored registration & checkout experience in Magento. 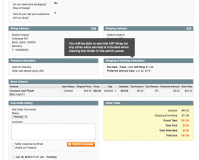 Manage delivery schedules conveniently in Magento. Let customers leave comments when they order a delivery.